The outgoing UN human rights chief has said the five permanent members wield too much power as they can veto resolutions even in cases of alleged injustices. Zeid Ra'ad al-Hussein has been outspoken during his term. 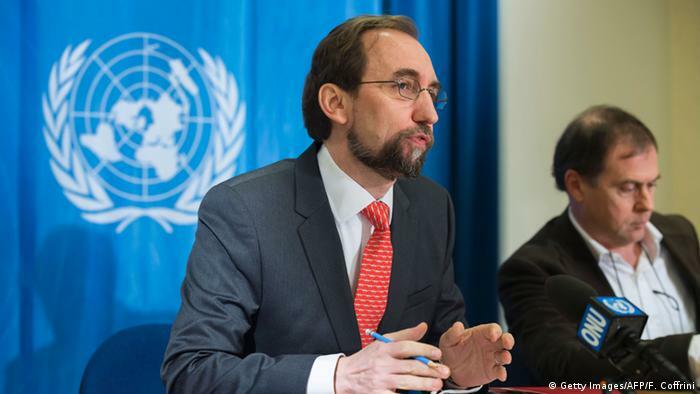 United Nations High Commissioner for Human Rights Zeid Ra'ad Al Hussein (L) speaks during a press conference. Zeid Ra'ad al-Hussein, the outgoing UN human rights chief, warned on Monday that the world body could "collapse" if the imbalance caused by the excessive powers wielded by the Security Council's five permanent members is not corrected. "There's a feeling within the UN that there is a sort of pentarchy — the P5 (permanent members) running too much of the business at the expense of the organization itself," Zeid said in reference to the US, Russia, China, France and the UK. Zeid was alluding to the countries' ability to veto resolutions in cases such as alleged injustices in Syria's war, or actions by Israeli forces against Palestinians. "When they cooperate things can move, when they don't, everything becomes stuck and the organization in general becomes so marginal to the resolution of these sorts of horrific conflicts that we've seen," he said. "And I think that has to change. In the end the organization can collapse at great cost to the international community." Zeid has been an outspoken critic of leaders across the world, including US President Donald Trump. Washington, on the other hand, has been critical of Zeid for unfairly targeting the Israeli government. "There is a sense that the permanent five have created a logjam by dint of their proclivity to use the veto, and the paralysis — less so the UK and France — but of course, the US, Russia and China quite frequently," Zeid said on Monday in a discussion with journalists in his office. Zeid told reporters earlier this month that he did not seek a new four-year term as UN High Commissioner for Human Rights because he did not believe the US, China, and Russia would support him. Zeid, whose term ends on August 31, will be succeeded by former Chilean President Michelle Bachelet.